WE WILL HAVE MORE DETAILS ON THIS UPCOMING EVENT AVAILABLE SOON! Reforming Art Productions' (RAP) Summer Youth Company Intensive is a unique summer training opportunity that provides a safe and nurturing environment for students to pursue the highest standard of technique, while also developing their artistry through mentored creative experimentation. Different than any other summer intensive, RAP's training program is designed to reflect an authentic dance company experience. We are committed to honoring the unique value that every individual brings to our space. Our small class sizes allow for every dancer to feel that their presence has been heard, seen, and valued. It is our mission to help students recognize their abilities to positively contribute within themselves. Students can expect to leave our program having developed a stronger body, a deeper sense of self-worth, and an authentic understanding of their contributory value. WHAT IS IT LIKE TO BE IN A PROFESSIONAL DANCE COMPANY? Our scheduling is designed to reflect what a day in the life of a professional dancer looks like, with classes running Monday through Friday from 9:00 am - 4:00 pm. With an emphasis on movement exploration and the development of new works, students will have the opportunity to showcase what they have created, with a performance opportunity on the last day of classes. 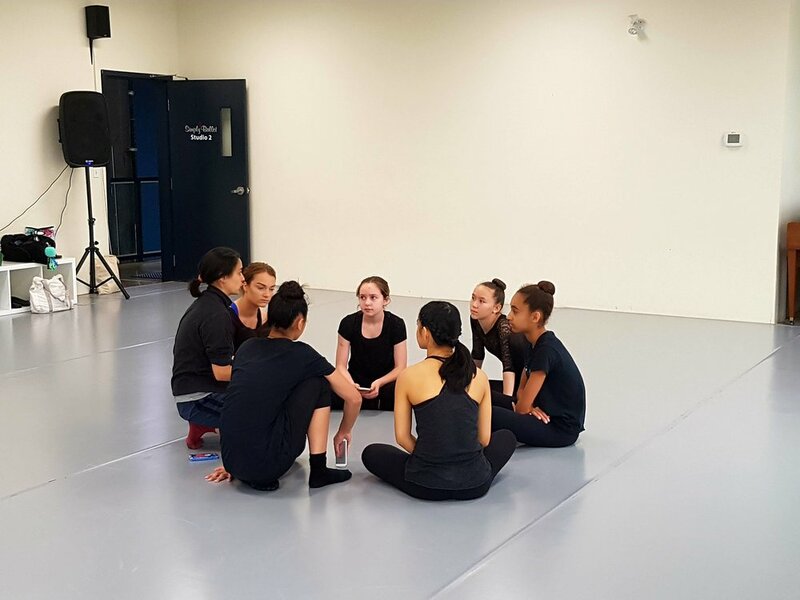 Composition: Through guided mentorship, students will have the opportunity to develop their own choreographic skills through creative investigation. Rehearsal: Every week students will contribute to the creation of a new work that will be shown on the final day of classes. ADVANCED: (13+) With a MINIMUM of 5 years of professional dance training. APPRENTICE: (11+) With a MINIMUM of 3-4 years of professional dance training. Group Discussions on different careers involving dance education. Dance on Film with Sophia Wolfe / Festival Of Recorded Movement. Improvisation / Choreographic Tools with local dance and acting professional Ralph Escamillan. Ballet: These classes focus on developing musicality, balance, correct muscle use, alignment and flexibility. Students learn the terminology of classical ballet through barre and center work. For the more advanced dancer, point shoes are encouraged to be worn for this class. Contemporary: This creative and grounded style of dance develops strength and dynamic phrasing. It uses the technique of contraction, release, fall and recovery, while also encouraging experimentation through guided improvisation exercises. Composition: Improvisations, Tasks, Phrase Manipulation. This workshop will provide dancers with the tools and freedom needed to create their own movement. Results created from this workshop will be showcased on July 22. Rehearsal: Every day students will be a part of the creation of a new work. These works will be showcased on Friday July 22. RAP TRAINING: Reforming Art Productions unique conditioning program. Changing daily, students will receive a taste of what it is like to be a RAP dancer. With activities including running on the seawall, ball conditioning, Pilates and Yoga techniques, Injury Prevention, Stretching. Students will need athletic clothing, running shoes, Yoga Mats, water bottles. Reforming Art promotes healthy bodies in ballet! With certified instructors, Reforming Art is proud to provide all students with Progressive Ballet Training as a method of conditioning. A mixture of Pilates and ball work, Progressive Ballet Training is an innovative conditioning program designed to help students understand the depth of training muscle memory in achieving their personal best in classical ballet.